Dell & Schaefer Attorney Anthony Quackenbush, a member of Broward Young Lawyers for Literacy Initiative, recently spent an afternoon in a classroom at Riverland Elementary School in Broward county reading to Kindergarten students. 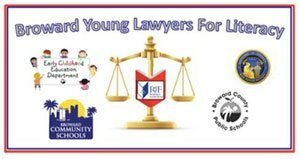 The Broward Young Lawyers for Literacy, a group of volunteers from the Young Lawyers Section of the Broward County Bar Association, was founded with the goal of creating community support for literacy in early childhood. As part of the Lawyers for Literacy Guest Reading Campaign, guest attorneys read and visit Pre-K and Kindergarten classrooms at several Broward County schools throughout the month of May, 2014. Guest readers will support reading in the classroom by reading aloud to the students, retelling the story and sharing what makes reading special to them. Attorney Anthony Quackenbush wants to build a legacy of literacy and learning and enjoys sharing the gift of reading. He hopes to motivate young children to realize books are great, and that books can make a difference in the in their world.